GoTriangle would like your feedback on proposed service changes. This feedback will be incorporated into final recommendations presented to the GoTriangle Board of Trustees in April 2019. If approved, these service changes would be implemented on August 4, 2019. Comments will now be accepted until April 24, 2019. In Person: Speak to the GoTriangle Board of Trustees at their meeting on noon at April 24 in the Board Room at GoTriangle’s administrative offices at 4600 Emperor Blvd, Suite 100, in Durham. Seniors 65 and older would ride free. Regional and express fares would become the same price. Mobile ticketing is planned for early 2020. OnDemand services would be discontinued and replaced with “Transit Connect” - a partnership with Uber and Lyft. 311 – The route would be realigned to serve Kit Creek Road and Davis Drive. North Raleigh Express (NRX) – New express route on I-540 would replace Route 201. 310W – New service would be offered from the Regional Transit Center to Wake Tech's Research Triangle Park Campus. FRX – New park-and-ride low would be created at Wake Technical Community College-Southern Wake Campus, replacing the park-and-ride at Hilltop Crossings Food Lion. Chapel Hill-Raleigh Express (CRX) – Schedule would change. Durham-Raleigh Express (DRX) – GoTriangle would add trips and make other schedule changes. Robertson Scholars Express (RSX) – GoTriangle would no longer operate the service after the school year. 700 – Construction reroute will become a permanent route. 102 – GoRaleigh Route 20, an all-day weekday route with hourly service, would replace it. Knightdale-Raleigh Express (KRX) – GoRaleigh Route 33, an all-day weekday route with hourly service, would replace it. 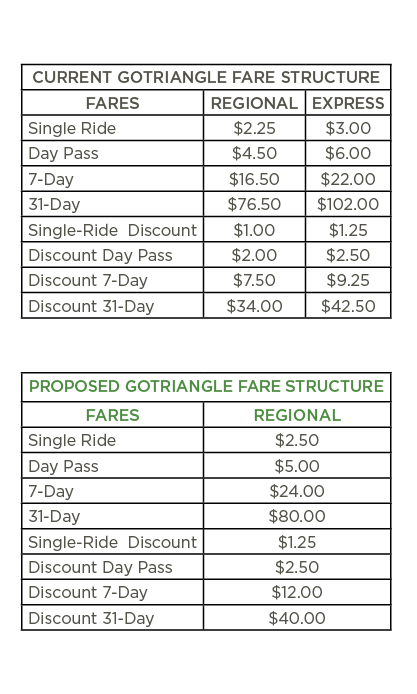 In an effort to improve the passenger experience and regional coordination among transit agencies, GoTriangle, GoRaleigh and GoCary are working to make fare pricing structures, policies and technology offerings consistent across agencies. The fare change proposal has three components: pricing, policy and technology upgrades, including mobile ticketing. Pricing and policy changes are scheduled for August 2019, with the introduction of mobile ticketing and fare capping planned for early 2020. GoTriangle would no longer have a price distinction between “Regional” and “Express” services. All GoTriangle routes would have a base fare of $2.50. The table reflects the new price structure. Seniors 65 and older would ride GoTriangle services free. Mobile ticketing, which allows payment using a smartphone, is expected to be available in early 2020. The technology also will allow GoTriangle to cap fares. Mobile ticketing eliminates the need for paper tickets and can help speed up the boarding process. This level of technology also allows transit agencies to track an individual customer’s purchases so that customers who buy single-day passes never spend more in a week or month than those who buy seven-day or 31-day passes. This benefit, called fare capping, is particularly beneficial for those who may not be able to buy more than a one-day pass at a time. Fare capping administered through mobile ticketing will automatically provide riders an extended pass once the payment threshold for the pass has been reached, allowing everyone to realize the same multi-ride savings. Transit Connect would provide the first/last mile connection to a public transit route and expand access to more locations within the designated RTP zone at all times of the day. The trip time would be competitive with current levels of service provided on fixed routes and OnDemand. Transit Connect would provide a subsidy of up to $10 for an Uber or Lyft trip within a defined Research Triangle Park zone for customers connecting to or from a public transit route weekdays between 6:30 a.m. and 10:45 p.m.
Customers would qualify for the subsidy if they use the Uber or Lyft app to request a ride that begins or ends within 1,000 feet of any fixed-route GoTriangle or GoDurham bus stop, including the Regional Transit Center. The second destination or origin can be any location within the RTP zone. The Transit Connect RTP zone is bordered by NC 55, I-540, Page Road, Lumley Road and Alston Avenue and includes the Regional Transit Center. GoTriangle Routes 800, 805 and 311 and GoDurham Routes 12 and 15 serve bus stops within the RTP zone where customers can connect to a subsidized Uber or Lyft trip. To improve ridership, Route 311 would serve Kit Creek Road and Davis Drive. Realigning the route to serve Kit Creek Road and Davis Drive would provide fixed-route service to employers such as Cisco, Pfizer and Biogen. Service to EPA/NIEHS would be possible through Transit Connect, but no longer available on Route 311. There are no changes to the service along NC 55 and within Apex. See proposed Route 311 map. The NRX would provide new express service from Triangle Town Center to the Regional Transit Center (RTC) via I-540, with a second North Raleigh stop, making a fast trip between North Raleigh and the RTC. The NRX replaces Route 201 to increase efficiency and enhance service options. New park-and-ride spaces would be available at Triangle Town Center at the bus stop near Sumner Boulevard and at a second park-and-ride lot near the Bent Tree Plaza shopping center at the intersection of Falls of Neuse and Strickland roads. The change means stops at Capital Crossing Shopping Center and Pleasant Valley at Glenwood Road and the Shelley Lake Park-and-Ride and the Spring Forest Road at Millbrook Exchange Park Park-and-Ride would be replaced with the two new NRX park-and-ride lots. See proposed Route NRX map. This route would provide access to the new Wake Tech RTP campus and expand GoTriangle’s hours of service into the midday to provide more flexibility for those traveling outside peak commute hours. New service from the Regional Transit Center to the Wake Tech RTP campus would operate every 30 minutes on weekdays from 6:30 a.m. to 8:30 p.m.
Later in FY20, the route would be expanded to connect the Regional Transit Center and Cary Depot via the Wake Tech RTP campus, providing a larger portion of Morrisville with all-day service. GoTriangle would provide direct service from Fuquay-Varina to Wake Tech’s Southern Wake Campus and improve park-and-ride options. New park-and-ride lot at Wake Tech – Southern Wake Campus would replace the Hilltop Needmore Road Food Lion Park-and-Ride (Stop ID 1962). Customers would have a direct connection from the Fuquay-Varina South Park Community Center Park-and-Ride to the Southern Wake Campus at 9101 Fayetteville Road. The CRX is one of GoTriangle’s most popular routes, and buses during the first departure of the afternoon often are full with standing room only. 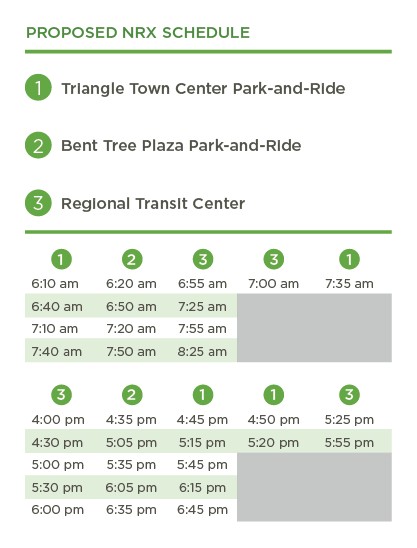 To improve on-time performance and enhance customer service, GoTriangle is proposing schedule changes that would better match service to demand. GoTriangle would add a trip that leaves Chapel Hill at 3 p.m. and Raleigh at 3:25 p.m. 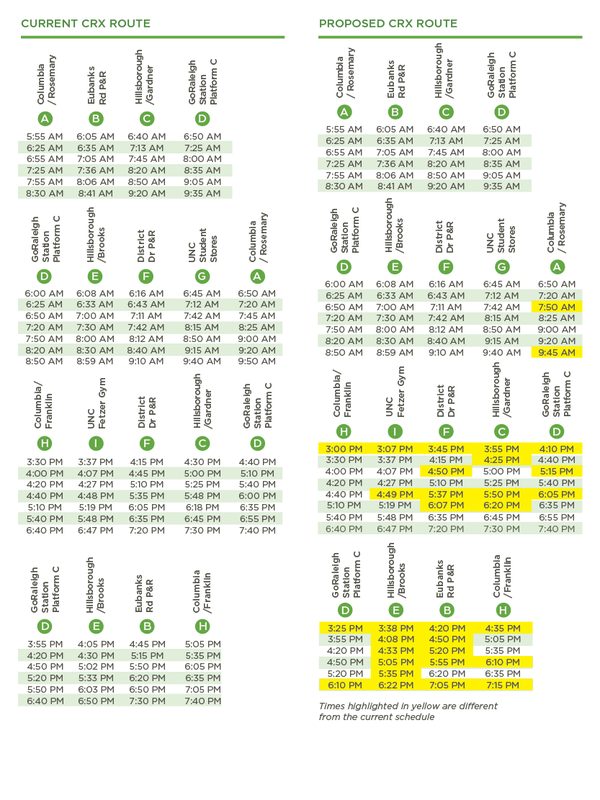 The 6:40 p.m. departure from Raleigh would be eliminated and the 5:50 p.m. departure shifted to 6:10 p.m.
Other minor schedule adjustments should improve on-time performance. The DRX is another one of GoTriangle’s most popular routes, and it can quickly fill up to standing room only. Adding trips to the DRX would provide more seats for customers and allow more frequent service that better matches the schedule to customer requests. Thank you to all customers who provided comments about the DRX schedule in February 2019. Staff members are considering the suggestions as they develop the schedule for this fall. Our goals are to provide consistent, frequent departures that match customer work schedules and timely connections to GoDurham and GoRaleigh routes. Add buses to the route to provide additional departures every 15-20 minutes during the busiest times of the day and to alleviate overcrowding. Add a trip departing Raleigh at 7:30 a.m. and Durham at 8:15 a.m.
Add a trip departing Durham at 4:45 p.m. Shift afternoon departures from Raleigh to better match ridership and provide 15 to 20 minute service between 4 and 5 p.m. That includes changing the 4:50 p.m. departure to 4:40 p.m. and the 5:10 p.m. departure to 4:55 p.m.
Make other schedule changes to improve on-time performance. Permanently implement the detour put into place in 2016. Customers can use GoDurham Route 8 to access Lawson Street and Durham Technical Community College and GoDurham Route 12 to access Alston Avenue. In FY18, the RSX did not meet GoTriangle service standards during midday, evenings and weekends. It was an average performer during peak times while declining in ridership overall. The RSX duplicates GoTriangle Routes 400 and 405 within the U.S. 15-501 corridor. GoTriangle would no longer operate the Robertson Scholars Express service starting fall 2019. Customers are encouraged to contact the Robertson Scholars Foundation directly with any questions. GoTriangle would continue to provide service between Chapel Hill and Durham on Routes 400 and 405. To better serve the rapidly growing Garner area, plans would expand existing service to Garner by providing an all-day hourly weekday route through our community investment in the Wake County transit plan. Effective September 2019, GoTriangle Route 102, which currently serves Garner, would become GoRaleigh Route 20 with hourly all-day weekday service from 5:30 a.m. to 12:30 a.m. Weekend service is scheduled to begin in FY24. To better serve Eastern Wake County, plans would expand existing service to Knightdale by providing an all-day hourly weekday route, another community investment through the Wake County transit plan. 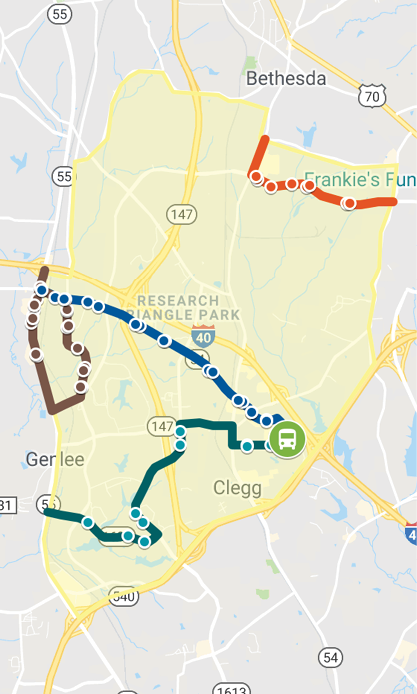 Effective September 2019, GoTriangle’s Route KRX would become GoRaleigh Route 33: New Hope-Knightdale, providing hourly service from 6 a.m. to 9 p.m. on weekdays. Proposed Route 33 would connect Knightdale to the New Hope Commons shopping center, which is served by multiple bus routes. GoRaleigh Route 15-WakeMed operates every 15 minutes and would provide onward service to downtown Raleigh. Planning for a new East Raleigh Transit Center is underway, and it will be the connection location once completed. Weekend service will be added in FY23. For more information about the proposed service, please visit GoRaleigh’s website. We would like to express our appreciation to those who provided comments on the proposed schedule changes for the GoTriangle Durham-Raleigh Express (DRX) route. After considering these issues, GoTriangle has decided not to change the DRX schedule until August 2019 when we can holistically address the on-time performance, crowding and frequency of the service at one time.